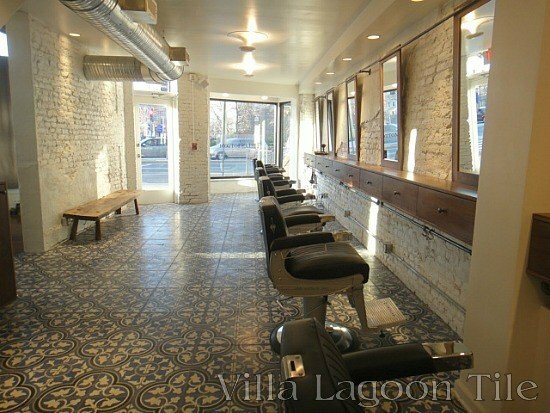 The Beltway is buzzing with THE new place for men’s grooming on the east coast: The Barber of Hell’s Bottom. A veteran stylist of New York runway and print models, Kelly Gorsuch took Washington, D.C. by storm with his Logan Circle salon, Immortal Beloved. In a few short years it has become a hub of the metro area’s chic and elite, with Immortal Beloved stylists even being tapped for First Family duty. Not only has Immortal Beloved become known for its styling, but for its unique decor. All of the furniture was designed and built by Kelly himself, along with his close friend and business partner Caleb Woodard (of Caleb Woodard Furniture). Can Kelly catch lightning in a bottle again? It sure seems so. Washington is abuzz again over The Barber of Hell’s Bottom. 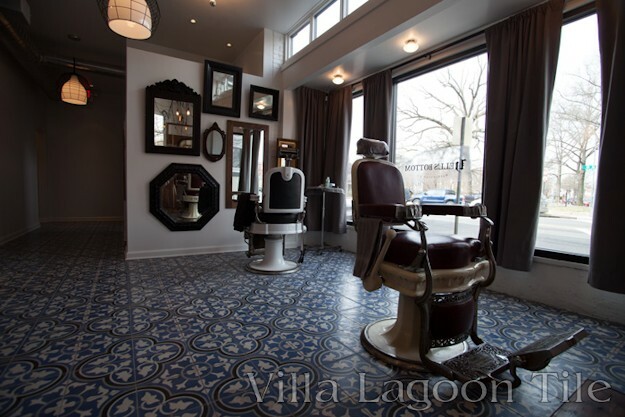 Once again featuring Kelly’s unique vision, and master craftsmanship from Caleb Woodard Furniture, this new barber shop features raw, white-washed brick walls, and beautiful cement tile from Villa Lagoon Tile. Our Roseton tile in custom colors was used to add a hint of flourish to Kelly and Caleb’s remarkable work. 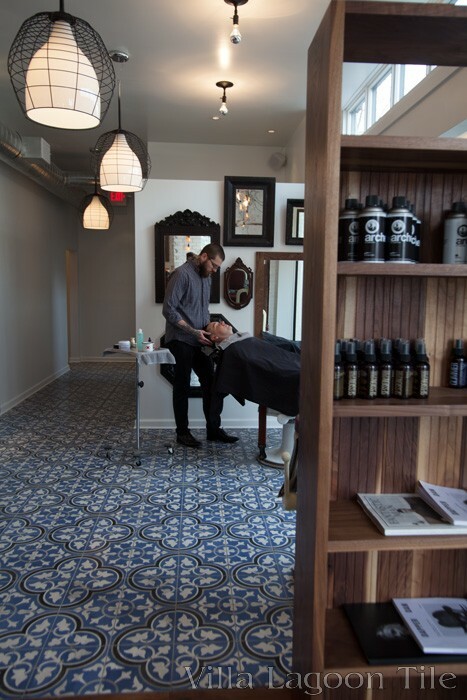 This shop has a sophisticated, but raw masculinity, that is sure to make any patron comfortable, while his locks float down to our flooring. Part of the buzz over Gorush’s new venture has to do with the name. While Shaw may have a median home price north of half-a-million dollars today, it was once “Hell’s Bottom”, one of the District’s most violent neighborhoods. 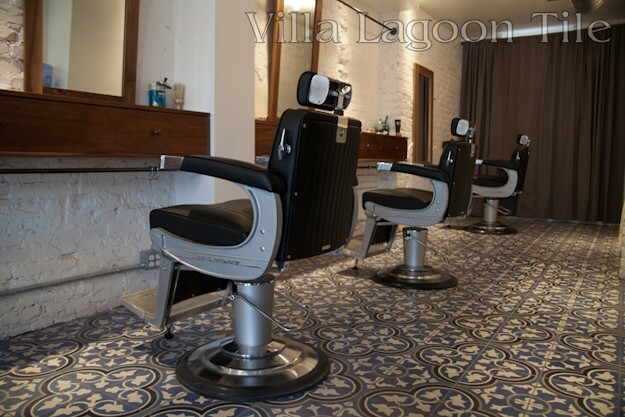 That cool bit of trivia doesn’t stop everyone from noticing the tile, though… nor the barber’s chair from the New York area’s Vernon Hills Country Club, famed to have held several members of the Rat Pack, in its day (not at the same time, of course). 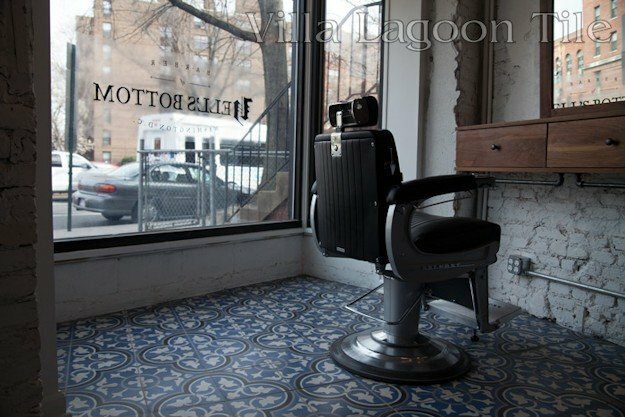 The Barber of Hell’s Bottom has been featured now in the style section of UrbanDaddy.com, given a favorable first look by UrbanTurf.com, and has even been named one of the six “things to do” for last weekend (April 5, 2013), by Men’s Journal ! Way to go Kelly ! We hope you the best success, and a long happiness with our tile. 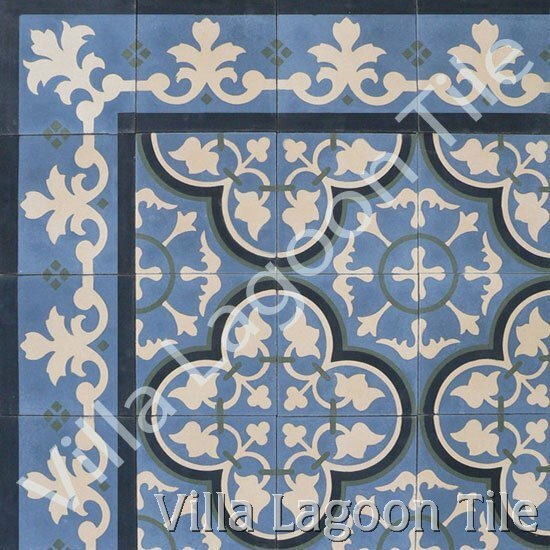 Roseton with matching border tiles.